A complete “Direct Port” nitrous system from Zex. Everything is included for a safe, proper installation. The only 4cyl. direct port nitrous system that can be safely jetted down to 50hp. This system works great on stock engines. Adjustable to 200hp, perfect for fully built competition engines. Uses one injector nozzle per cylinder. 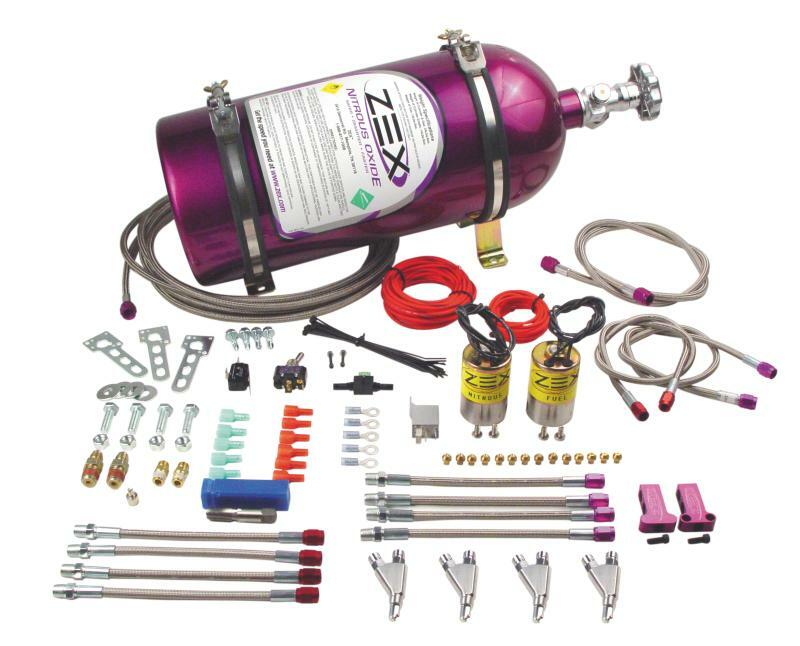 Gives perfect nitrous and fuel distribution. Features easy to install, pre-made nozzle flex-lines. No hours wasted on cutting and bending hard-lines. Dual-stage jet technology uses one jet in the distribution block and one jet in the injector nozzle. Offers much finer tuning adjustments as well as easy HP level changes. Unique nozzle design has “Active Fuel Control” built in. This feature monitors bottle pressure and when the nitrous system is engaged, it adds or subtracts enrichment fuel so the engine never runs too rich or too lean.